The number of genuine landmark instrumental albums in rock history can be counted on the fingers of the proverbial one hand. THE most important and influential is Mike Oldfield's classic and timeless Tubular Bells. Hard to imagine that it's 40 years old in 2013, but not quite so difficult to see why it has, to date, racked up sales of well over 15 million copies and become, for many of us, the soundtrack to the 1970s. It is all too easily to think that Oldfield's career could have become defined by his masterpiece, but his creativity reached out in may directions to create a diverse catalogue of intriguing music. Stylistically his music has included, style that blends prog rock, folk, ethnic or world music, classical music, electronic music, New Age, and more recently, dance. His second album, Hergest Ridge in 1974 also went to No.1 in the UK, as did Tubular Bells II in 1992. "The idea for Tubular Bells came while I was with Kevin Ayers' group. We used to travel up and down the M1 in a Ford Transit. We just happened to be at the same venue as this huge jazz orchestra; it was called Centipede and it was organised by Keith Tippett. That was the first time I had ever seen or heard a long piece of music. It was about 25 or 30 minutes long with all sorts of different styles and musicians African musicians, jazz musicians, even a rock vocalist. I thought this was a stunning idea and having listened to and loved classical music for most of my life, but being a rock musician, I just got the idea of making my own electric version of it. I'm loath to call it a symphony, but in effect that's what I tried to make it." When The Whole World split up Oldfield was left unemployed for a while and after a less than successful spell as a guitarist for the musical, Hair, he joined the unpromisingly-named Arthur Lewis Band as bass player, Lewis has been described as playing in a style that resembles a cross between Jimi Hendrix and Bob Dylan! Whatever the case in September 1971 the Lewis band and Oldfield went to The Manor Studios in Oxfordshire to cut some demos. The Manor had only recently been converted into recording studios and there was a real buzz about the place. Resident engineer and producer Tom Newman and his collegue, Simon Heyworth got to know Oldfield and listened to his demo tape of the piece he was at this point calling, Opus One. According to Oldfield: "I told them that I had some tapes that I'd really like them to hear so I got in my car and went all the way back to Tottenham, where I was living, for my demo tapes and took them back to The Manor and played them to Tom and Simon. They really liked them." The upshot of all this was that Tom and Simon took Mike under their wing and he ended up living at The Manor and, although in Newman's words "useless", he helped them out with the ongoing building work. All the while though he was further developing ideas for Tubular Bells and trying his hand with as many instruments as he could lay his hands on. Newman and pestered Richard Branson and his right-hand man Simon Draper until they agreed listen to the tape. They agreed to meet Oldfield and give him a week's studio time to start recording his opus. Suitably impressed with what he'd achieved in a week but anxious that The Manor should actually start making some money they arranged to let Oldfield finish his work in down-time not ideal but an opportunity that he leaped at. One of the early recording session at The Manor was with The Bonzo Dog Band, which is how the great Viv Stanshall came to be featured as Master of Ceremonies on Tubular Bells. Oldfield: "He came in and I pointed at all the instruments and he'd say 'Grand piano, tubular bells...', etc. Then he went out again and that was that." The fact that Tubular Bells was ever completed is something of a miracle because besides the random recording schedule Oldfield was having personal problems "I was in a very insecure frame of mind at that time. I had problems with my family and the time I'd spent with Kevin Ayers wasn't very happy and I was probably having a nervous breakdown. That's the way I would describe things around the time of Tubular Bells." Twenty-two minutes of history were complete, but it took a long while for things to really begin to happen; first Oldfield had to complete the second side of the album. In the last month or so of 1972 and the start of 1975 Branson and Draper were busy signing other acts to complete their initial roster. As a new label they did not have the financial muscle of a major record company and so generally the deals revolved around free studio time and a stipend of £20 a week. But the lure of a record deal is just that and soon they had three other releases lined up top go with Tubular Bells. According to Hayworth, "It was released as a last resort. 'Well we might as well launch the Virgin label with it; if we're going to do it let's do it with this and be really different.' I think that's what captured Richard Branson's imagination, the fact that he was being different and daring, going where no man had gone before." And so it came to pass that Virgin Records was launched with Tubular Bells as its initial release in May 1973. With immediate critical acclaim the album was at No. 7 in the UK album chart two months later and reached the coveted No. 1 spot after a year. It stayed in the charts for 279 weeks. It would be no exaggeration to say that without it Virgin Records would not have gained the impetus to become such an important label so quickly and therefore pave the way for Richard Branson to expand his empire into almost every area of our lives. The initial attention surrounding the album's release peaked a month later with its live performance at London's Queen Elizabeth Hall, an event which the shy, retiring and self-conscious Oldfield initially resisted (he was persuaded when Branson apparently asked him what he could give him and Oldfield replied "your Bentley") and afterwards declared a disaster. Naturally, everyone else thought it a triumph and gave him a standing ovation. On top of that the album was given a further boost, especially in the US, when the opening piano sequence was used in the horror film The Exorcist. And so to a large degree Tubular Bells has to this day continued to be a large part of Oldfield's life. There have been several live versions released, including the aforementioned one with The Royal Philharmonic Orchestra, and then a series of albums based around a similar theme - Tubular Bells II (1992), Tubular Bells III (1998) and The Millennium Bell (1999). There has also been Tubular Bells 2003, which is a re-recording of the original piece using the then latest digital technology and substituting John Cleese for Viv Stanshall. The original album has been re-released in a number of guises countless times as well. Of course Mike Oldfield's creative work didn't stop there. His follow-up album, Hergest Ridge, came out in September 1974 and went to No. 1 in the album chart only to be displaced by Tubular Bells. And this was followed by Ommadawn in November 1975 and Incantations in November 1978. He's since continued to record and release music in a variety of forms and genres - film soundtracks, ambient/new-age, classical, instrumental, pop, even Christmas records, but the fact is he will always be best-known (and who wouldn't want to be?) for Tubular Bells. Mike Oldfield's groundbreaking album Tubular Bells is arguably the finest conglomeration of off-centered instruments concerted together to form a single unique piece. A variety of instruments are combined to create an excitable multitude of rhythms, tones, pitches, and harmonies that all fuse neatly into each other, resulting in an astounding plethora of music. Oldfield plays all the instruments himself, including such oddities as the Farfisa organ, the Lowrey organ, and the flageolet. The familiar eerie opening, made famous by its use in The Exorcist, starts the album off slowly, as each instrument acoustically wriggles its way into the current noise that is heard, until there is a grand unison of eccentric sounds that wildly excites the ears. Throughout the album, the tempos range from soft to intense to utterly surprising, making for some excellent musical culminations. Mandolins and Spanish guitars are joined by grinding organs and keyboards, while oddball bells and cranking noises resound in the distance. In the middle of the album, guest Vivian Stanshall announces each instrument seconds before it is heard, ending with the ominous sounding tubular bells, a truly powerful and dominating instrument. The most interesting and overwhelming aspect of this album is the fact that so many sounds are conjured up yet none go unnoticed, allowing the listener a gradual submergence into each unique portion of the music. 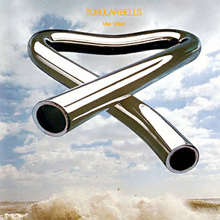 Tubular Bells is a divine excursion into the realm of new age music. Released as another lengthy composition, Hergest Ridge was the album that followed Mike Oldfield's momentous Tubular Bells release, with many of the same instrumental elements and methods employed throughout its two sections. 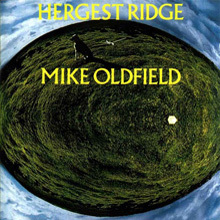 Because of the time of its release, Hergest Ridge was overshadowed by the effects of Oldfield's first album for Virgin, but even so, he still manages to invoke some interesting patches of music by using instruments like the glockenspiel, sleigh bells, the lowrey organ, oboes, and a variety of mandolins and guitars to maintain the same type of diversity as Tubular Bells. Symphonic throughout most of the album's two parts, the highlight of Hergest Ridge is Oldfield's use of 90 multi-tracked guitars which are clustered together to create one of the most unique sounds ever to surface on his albums. Actually, Hergest Ridge entered the British charts in the number one spot in the fall of 1974, but Tubular Bells finally took its place only three weeks later. The album was highly regarded in the U.K. upon its release and it continues Oldfield's creativity, proving that the genius put forth on his claim-to-fame album would indeed have some effect on works to come. 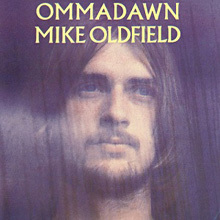 Although it features the beautiful recorder of Leslie Penny and the Chieftains' Paddy Maloney playing the uilean pipe, Ommadawn didn't gain Mike Oldfield the success he was looking for. The album was released in the same year as the David Bedford-arranged Orchestral Tubular Bells and nine months after Oldfield picked up a Grammy award for the original Tubular Bells album. The most pleasing attribute of Ommadawn is its incorporation of both African and Irish music in its symphonic rock &a roll mainframe. Boosted by a hearty amount of different horns, piano, cello, trumpet, and synthesizer, the album has its moments of rising action, but the whole of Ommadawn fails to keep its lovely segments around long enough, and there are some rather lengthy instances that include bland runs of unvaried music. Another plus is Oldfield's use of a choir, giving the album a soft, humanistic feel when contrasted against the keyboards or synthesizer. After a two-year pause following the release of Boxed, Mike Oldfield returned with a new epic project, this one spread over four vinyl sides and devoted to Native American themes rather than hewing once more toward the Celtic end of the spectrum. Included was Oldfield's musical adaptation of "The Song of Hiawatha". With this album, Oldfield began to make an attempt to break down his extended structures into a more commercially acceptable format, with the side-long title track being separated into four sections. Early versions of the album included "Sally," Oldfield's paean to his partner Sally Cooper, while later pressings include "Into Wonderland." 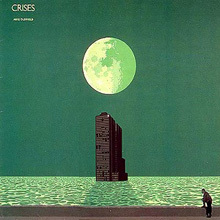 Following a long-established production pattern, Mike Oldfield assembled some relatively simple pop- and rock-flavored numbers following one long introductory piece on his 1983 Disky release, Crisis. The 20-minute opening title-track is a quintessential Oldfield texture study that consists of sparkling synth washes with edgier material weaving in and out. A fine setup, this track cleanses the aural pallet, preparing the listener nicely for the tunes that follow. Yes fans who can adjust to the sugary highlight "In High Places" will enjoy Jon Anderson's springy vocal work on the track. The energetic guitar romp "Taurus 3" will also appeal to most prog and art rock fans. Those in search of more ethereal Oldfield material should be aware of this record's pop leanings, but open-minded listeners will have a good time exploring Crisis, one of Oldfield's better releases of this type. With 1984's Discovery, Mike Oldfield seems to be back on track, utilizing the vocal power of Maggie Reilly and the drum playing of Simon Phillips to create some rather appealing selections. "The Lake" is a simply gorgeous instrumental inspired by Switzerland's Lake Geneva, the location in which the album was recorded, while "To France" is a powerful pop/rock tune based on the life of Mary, Queen of Scots. 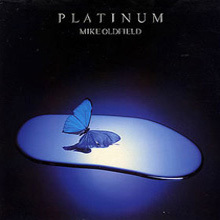 Both Reilly and Barry Palmer share the vocal duties throughout the tracks, signifying Oldfield's subtle emergence into a more pop-infused atmosphere. "Tricks of the Light" is a wonderful instrumental that relies on the keyboard to give it energy, while even so-so efforts like the title track and "Poison Arrows" come off as upbeat and inspired. Discovery peaked at number 15 in the U.K., and even though it didn't garner much attention elsewhere, it serves as one of Mike Oldfield's most entertaining releases from the decade. Earth Moving is the 12th record album by Mike Oldfield, released in 1989. Unlike Oldfield's previous albums at the time this contained only 4 minute pop and rock songs. Oldfield used several vocalists on the album, including his then girlfriend, Anita Hegerland. The album's music was performed mainly with synthesizers. 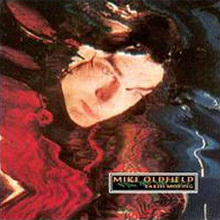 It was the first time Oldfield recorded an album without an instrumental piece; each track being vocal-based pop and rock songs. 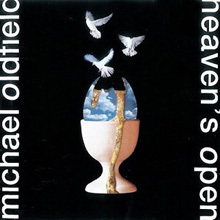 Heaven's Open is the 14th record album performed by Mike Oldfield, released in 1991. 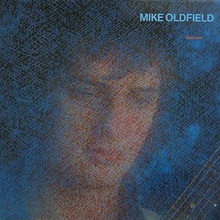 It was his last album on Virgin, and also the only album he released under the name Michael Oldfield, instead of Mike Oldfield. By 1991 and the release of Heaven's Open, Oldfield was happy to leave Virgin Records. The final goodbye to Virgin appears at the very end of "Music from the Balcony", where we can hear quiet laughter and Oldfield's voice saying "F*** off!". 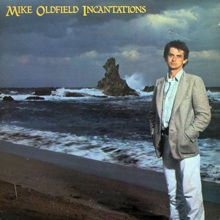 This is the only album where Mike Oldfield performs the lead vocals himself, and was pleased to discover that he was not as bad a singer as he thought he was. Probably because of his bad feelings towards Virgin, his name is spelled out in full - Michael Oldfield - on this album. The producer of the album, Tom Newman's name was also spelt out in a similar manner, as Thom Newman. 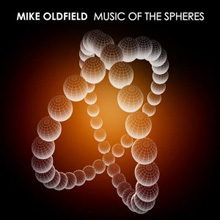 The title of Mike Oldfield's classical-influenced opus Music of the Spheres is a reference to the prolific and eclectic composer's feeling that all music should aim to represent the spiritual or otherworldly elements of life: something beyond the mundane and everyday. He accomplishes that through the hypnotic beauty of the gentler passages and the percussive drama of others, both of which characterize the multi-movement opening track, "Harbinger," which lives up to its title as a preview of the overwhelming, ethereal joys to come. Recorded with a full orchestra (with Oldfield on guitar) and arranged and conducted by modern classical composer Karl Jenkins, Music of the Spheres is a rich, heartfelt collaboration that breaks new ground for both men.